It is now about the final result – so please keep it going and spread the news on all channels..
bitterfeldt among the nominees for the Dark Music Awards 2017! We are proud and happy to announce that bitterfeldt has been nominated for the Dark Music Awards 2017. This prize is awarded by the well-known web magazine terrarelicta.com, the winners are selected by the readers. Thank you so much in advance, we really appreciate it! each month, the fine folks of BLACK MANTIS – the well-known label for compilations, choose a Label Of The Month. They set up a playlist on Spotify & Deezer featuring selected songs from artists that are signed to the label – and this time our beloved label, MASSACRE RECORDS, has been chosen. It is an honour and pleasure for us to announce that one of BITTERFELDT´s songs has been selected by BLACK MANTIS to be part of this very special list, too. You will find the whole list below. Feel free to spread the word – and if you like share the links. Our first album Götzen.Dämmerung is available everywhere now! We sincerely hope that you will enjoy the dark grey and gloomy music. Please help to spread the word and sow the dark bitterfeldt seed. If you recommend the album and the video to as many people as possible, you will be a big help on our way towards the abyss. Your support is important and means a lot to us! SUPPORT DARK MUSIC! And we will be eternally grateful! The special digipak edition, which is strictly limited to 1000 copies only, can be purchased in our shop at a fantastic price. First come, first serve! Only one week left: Götzen.Dämmerung will be available on all common channels starting Friday, March 24! The album will be released as a normal cd, but also as a brilliantly dark digipak. This digipak is limited to 1000 copies only and contains a special artwork by Master Artist Aleksandar Zivanov as well as two exclusive bonus tracks, Nocturnus I & Nocturnus II, produced by André Höche. To celebrate the occasion, we are glad to make you a special offer: you can get the digipak for a very special price at our partner shop Value Merch. bitterfeldt is something special – and so are their live gigs: they only take place on special occasions at special locations. bitterfeldt will headline this small, but precious little festival gem (support: Terrible Headache, Torment of Souls, Orvois). 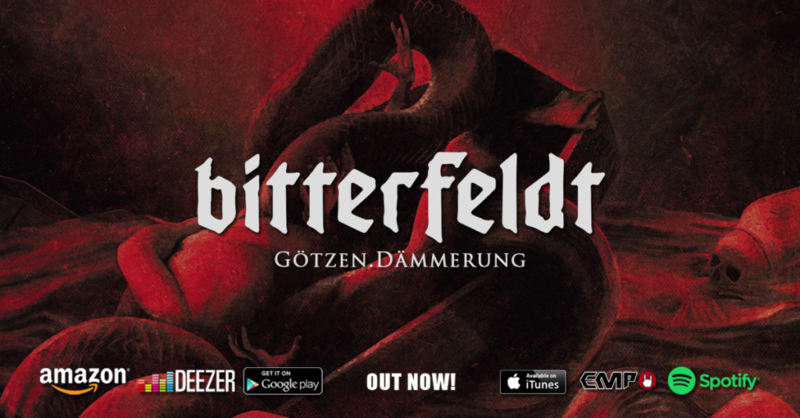 This will be the first time ever that we present our new album Götzen.Dämmerung live and we hope to see you there for this memorable occasion. It is an honour and a pleasure to announce that our website is finally available to our international audience. Now you can find all relevant information in English as well. And finally, on March 24th, Götzen.Dämmerung will see the dark of day!